This SureCall Force5 kit is the cream of the crop. It boasts a single super-powered booster and four different antennas that can be placed far apart to create a single area of up to 25,000 square feet with great cell signal. It can be extended too… with more antennas you get more boost and that will help eliminate dead spots. But let’s be honest, it’s not cheap. So are you better off having more than one booster? For the price of one Force5 you can get, oh, 7 or 8 EZ4Gs, and then you’re talking about a real huge increase in power. In general I recommend using as few boosters as possible to get the job done. Adding antennas to a booster system will help you customize the coverage but remember that each time you split the signal from the booster you cut the power in half. You’re always going to have the same amount of power but by splitting the antennas you’re customizing the coverage. You’re getting more small coverage zones instead of one large one. This is usually better for homes and offices because cell signal radiates from an antenna in a round pattern and most buildings are usually rectangles. Using more antennas will help you fit the cell booster coverage to the space you have. Unfortunately, FCC rules prohibit the cell booster companies from selling line amplifiers, so you’re stuck with the amount of power coming out of that booster. With something like the Force5, you’re talking about really strong boost along with the maximum allowable output power, which is more than you’re going to get from DIY, residential boosters. There’s another piece that needs to be considered, which is that while small boosters can handle 6 or 8 users at the same time, not usually more, something like a Force5 can handle 100 users at the same time, making it easier for large areas to handle large amounts of traffic. 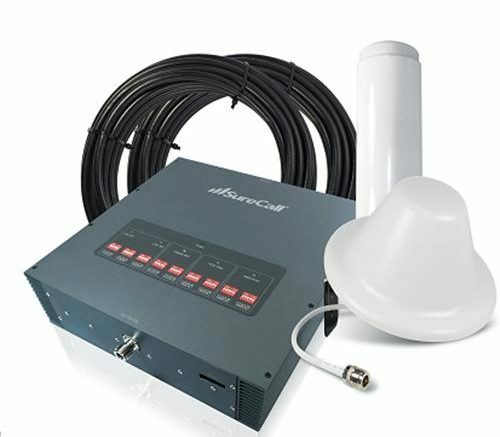 In order to handle 100 users comfortably, you would need 15-18 small cell boosters and the total price would be a lot more than the cost of a single Force5. Not to mention, when you’re talking about multiple cell boosters, if you’ve chosen one with an outdoor antenna (and these are still the norm for larger installations) you would need a separate antenna for each booster. You would need to plan the installation so that the antennas each had a clear line of sight that wasn’t blocked by another antenna. Then you would have to deal with routing all those cables and it seems to me that planning antenna separation would be a bit rough. Remember, each indoor antenna needs to be 15-20 feet from the outdoor one so I can imagine wires crossing all over the place. It gets to be a real nightmare. Avoiding nightmares like that is just the sort of thing that large industrial cell boosters are designed for. They solve problems like multiple boosters, can be easily customized, and if you still need even more coverage, you can plan a system with multiple boosters and larger outdoor antennas so the boosters can share a single antenna. No matter how you slice it, it’s a much better solution. If you’re looking for a cell booster solution, shop Solid Signal today!